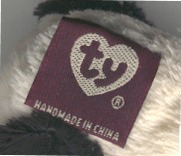 Front of tag has the beige Ty Logo� and reads "HANDMADE IN CHINA." Tush shown if from a seventh generation Baron. 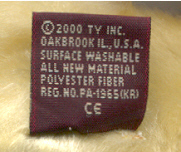 Back of tag reads " �2000 TY INC. OAKBROOK IL., U.S.A. SURFACE WASHABLE ALL NEW MATERIAL POLYESTER FIBER REG. NO. PA1965 (KR)" with the small C E.
Front of tag has the beige Ty Logo� and reads "HANDMADE IN CHINA." Tush shown is from a seventh generation Easton. Back of tush reads "� 2000 TY INC. OAKBROOK IL, U.S.A. SURFACE WASHABLE ALL NEW MATERIAL POLYESTER FIBER & P.V.C. PELLETS REG. NO PA-1965(KR)" and the small C E.